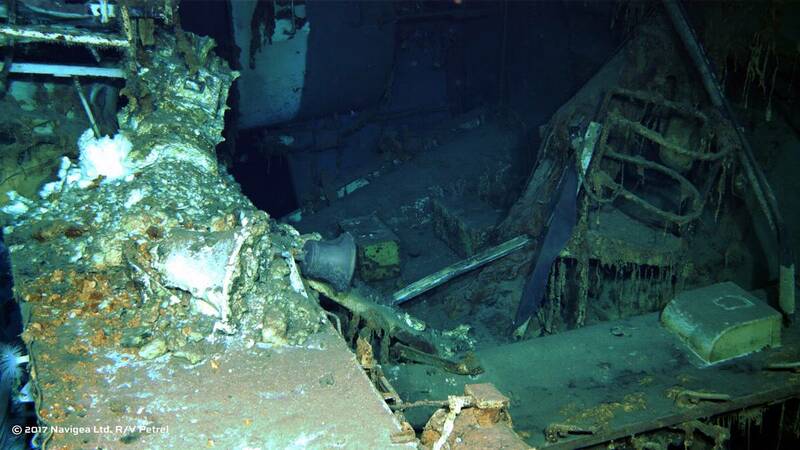 Sunk by Japanese torpedoes near the end of World War II, heavy cruiser USS Indianapolis disappeared to the darkest depths of the Philippine Sea, where it remained undiscovered for more than 70 years. 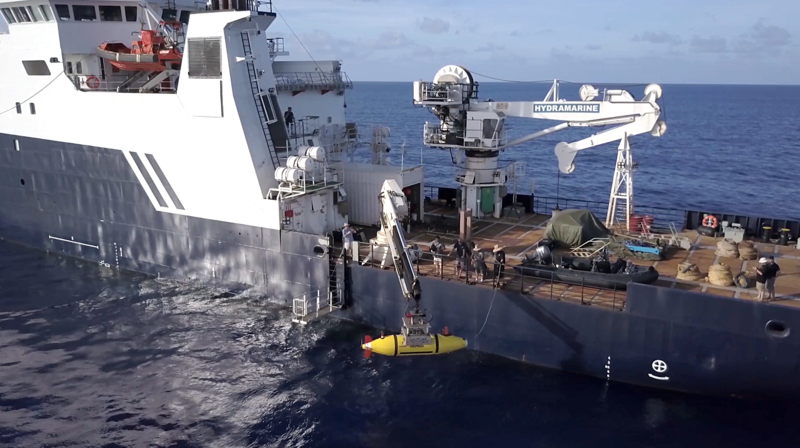 Recently a team of civilian researchers led by Microsoft co-founder Paul G. Allen set out equipped with an arsenal of high-tech search equipment on a mission to locate the historic vessel last seen on July 30, 1945. The story of the USS Indianapolis is one of military might, heroism, tragedy, controversy and mystery. Built by New York Shipbuilding Corporation in Camden, N.J., the 623-ft., 9,800-ton Portland Class heavy cruiser USS Indianapolis (CA-35) entered service in November 1932, serving through campaigns that earned the ship 10 battle stars over the course of World War II. 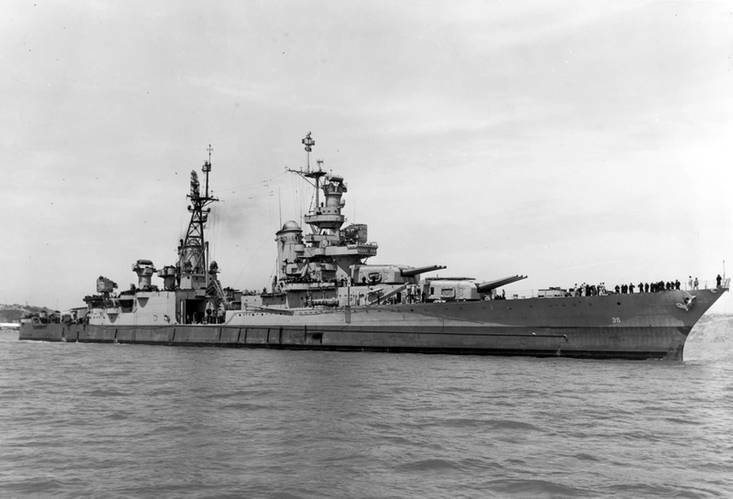 But after much success in battle, the fate of the Indianapolis eventually turned tragic as World War II neared its end. In the early hours of July 30, 1945, having just completed a secret mission to deliver materials from California for the first operational atomic bomb, “Little Boy” to a naval base on the Pacific island Tinian, Indianapolis was en route from Guam to Leyte when it was torpedoed by Japanese submarine I-58. Indianapolis sank quickly – reportedly in just 12 minutes – leaving little time for the crew to deploy lifeboats or for an emergency signal to be sent. It is estimated that 800 of the nearly 1,200 Sailors and Marines on board survived the sinking, but a communication error prevented Navy command from having any knowledge of the sinking, and rescuers were not immediately dispatched. This left survivors to battle exposure, dehydration, drowning and shark attacks for a grueling four to five days at sea until help finally arrived. In the end, only 316 were rescued in what remains the largest loss of life at sea in U.S. naval history. Due to the ship’s rapid sinking and lack of a distress call, the ship’s location had long remained a mystery – until recently. Microsoft co-founder, philanthropist and entrepreneur Paul G. Allen is fascinated with World War II history. Combining this passion with a spirit of technological innovation, Mr. Allen and his Seattle-based company Vulcan Inc. set out to hunt for the Indianapolis. 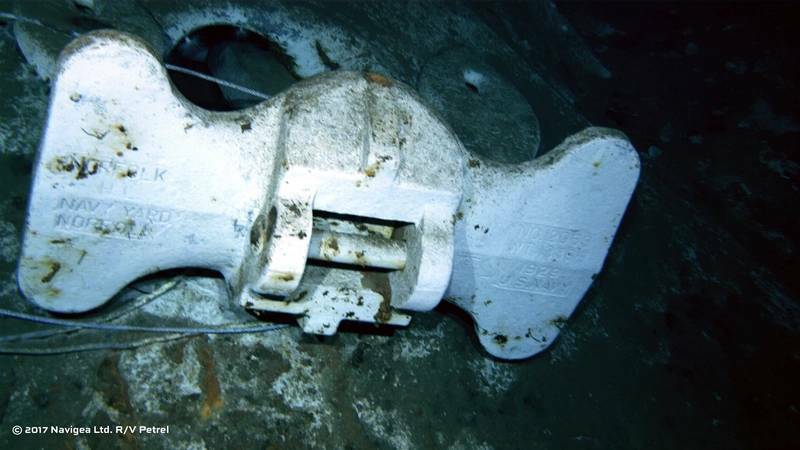 The team embarked with several high-profile marine archaeology projects already under their belt, including the discovery of Japanese battleship Musashi in March 2015 and Italian WWII destroyer Artigliere in March 2017, as well as the recovery of the bell from the HMS Hood for presentation to the British Navy. Other search missions to locate Indianapolis have been undertaken by various groups over the years, but all have come up short – partly due to a lack of sufficient technology. 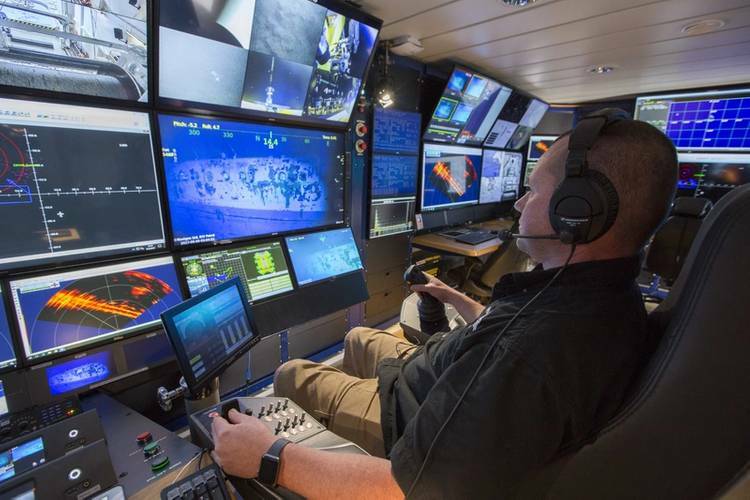 For the Indianapolis search, Mr. Allen deployed an exploration team outfitted with the latest state-of-the-art deep search and exploration equipment aboard the newly acquired 76-meter-long DP2 vessel RV Petrel. Vulcan Inc. purchased the offshore service vessel in 2016 from subsea engineering, construction and services company Subsea 7. 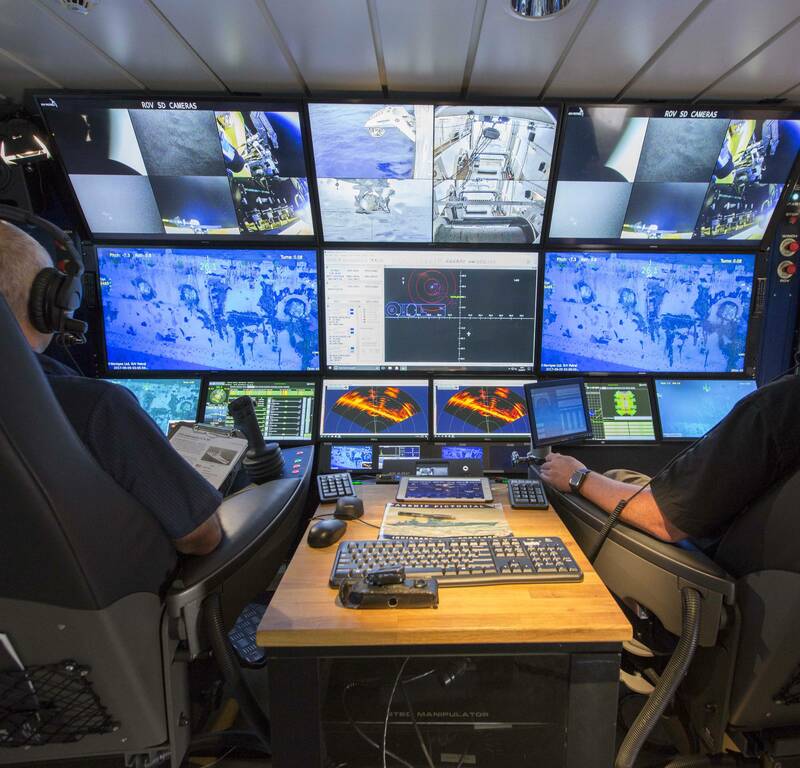 The ship was converted into a bonafide deep submergence research vessel in 2017, and now sails as one of the select few ships worldwide equipped to explore 6,000 meters below the ocean’s surface. 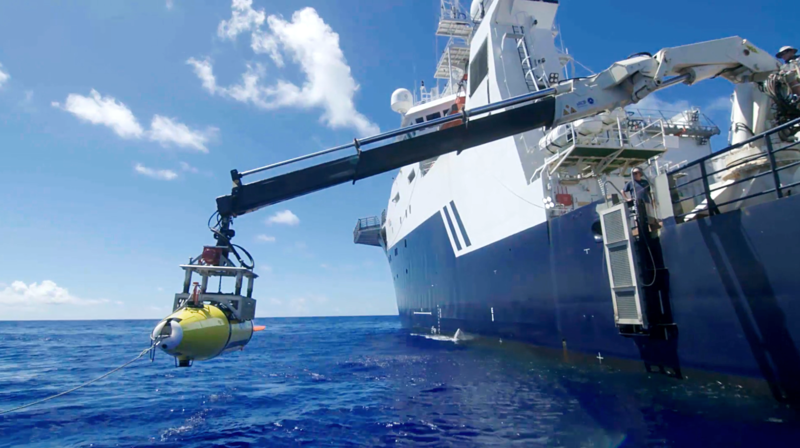 For the Indianapolis search, the Vulcan team conducted a significant amount of research, leveraging a combination of historical records, detailed undersea topographical data and advanced technology to explore a 400 square nautical mile search area between Guam and Palau in the Philippine Sea. A key data point came from a discovery by Dr. Richard Hulver, a historian with the Naval History and Heritage Command, who identified a naval landing craft that had recorded sighting the USS Indianapolis hours before it was torpedoed. All this research led to a new estimated position west of where previous searches have been conducted. 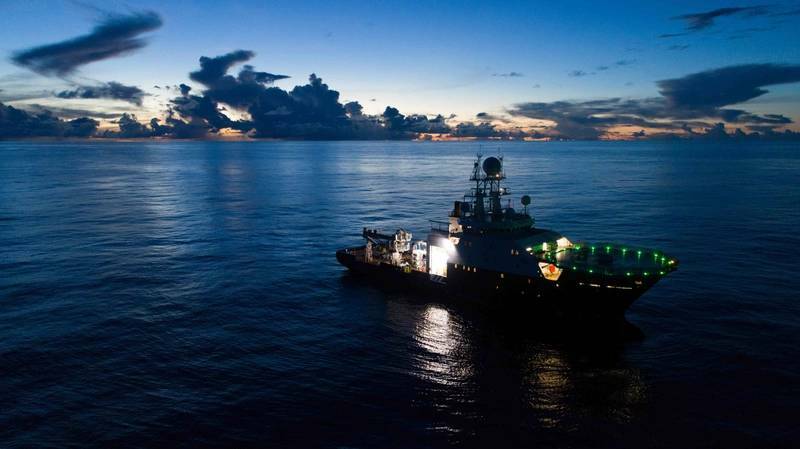 But even with the new insight, finding a ship that has been missing for over seven decades is no easy task, especially at depths greater than 5,000 meters. Aiding Vulcan’s team is a 6,000-meter-rated autonomous underwater vehicle (AUV), the REMUS 6000, manufactured by Kongsberg Maritime subsidiary Hydroid Inc., which gathered sonar data to locate the USS Indianapolis. 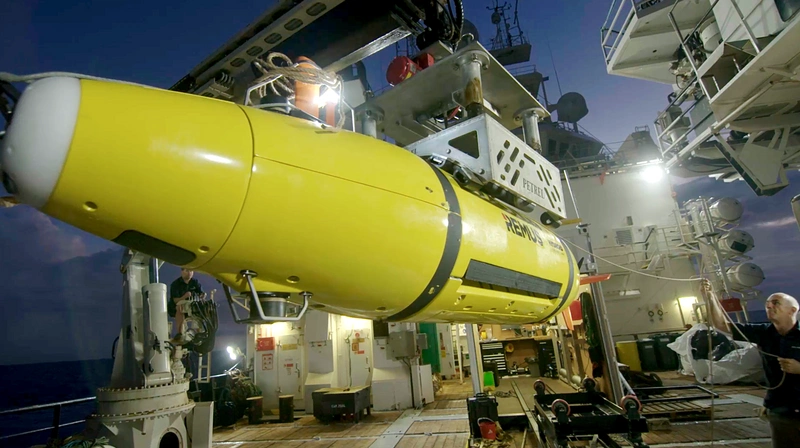 To find the long-lost Indianapolis, the REMUS 6000 AUV was equipped with long range, high resolution side scan sonar and bathymetry equipment for scanning the seafloor to detect and classify anomalies. The EdgeTech dual frequency 2205 75kHz / 230kHz side scan with interferometric bathymetry was mounted on the AUV to acoustically image a large 1 km range (in low frequency mode) from each side of the vehicle while flying preprogrammed deepwater searches in a mowing pattern. Once a search grid was completed, the AUV surfaced at a preset location for retrieval to the Petrel. On board the team downloaded stored survey data for review and swapped batteries for redeployment. Data analysis revealed seabed anomalies such as geology features or manmade objects/debris that could potentially point out the location of the missing warship. 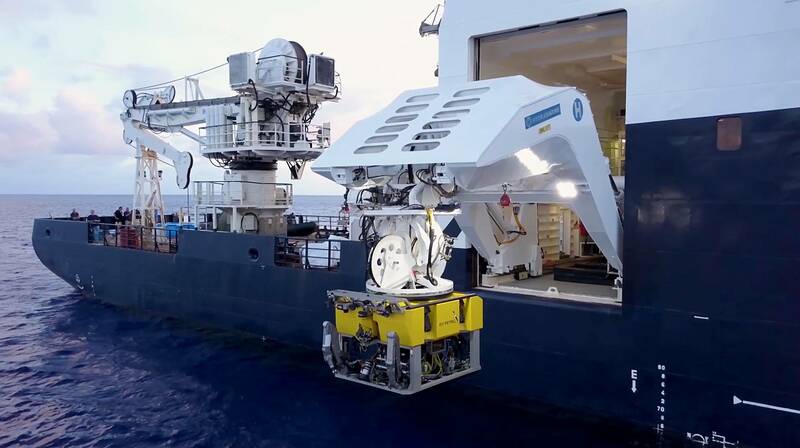 Once targets of interest were identified and mapped at closer range and higher resolution at 230 kHz, the Petrel team deployed a newly built, class-leading remotely operated vehicle (ROV) system for positive identification. 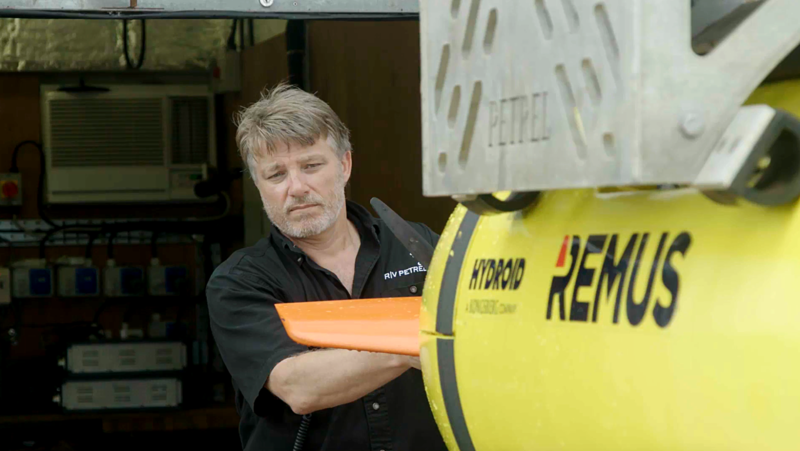 Mr. Barrett explained that the Petrel ROV serves primarily as a camera and survey sensor platform that must maintain a no-touch policy out of respect for the hallowed wreck sites it typically explores. “The vehicle system must provide a stable platform with excellent station keeping capabilities for close proximity video work, have a powerful propulsion system to combat currents impacting both the ROV and the entire 6,000 meter umbilical length, provide the operators with outstanding situational awareness and operate reliably and efficiently for extended durations,” he said. Synchronized pilot and co-pilot chairs allowed vehicle control and navigation to be switched between pilots, complete with touchscreen displays to support simultaneous operation of lights, cameras, positioning and hydraulics. The system even included an automated ascent and descent for the umbilical winch that enabled pilots to automatically synchronize ROV depths. 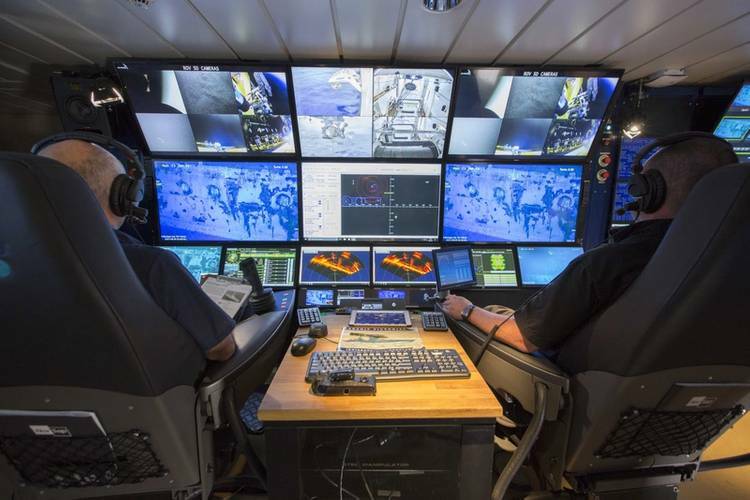 “Greensea’s OPENSEA control system is crucial to our success for extreme deep diving operations. 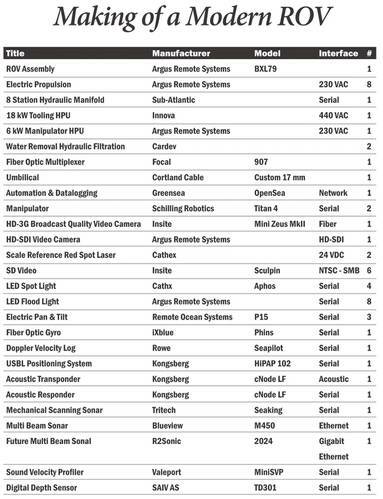 Never before have I experienced an ROV control environment as unified, configurable or integrated as this one,” Mr. Kraft said. 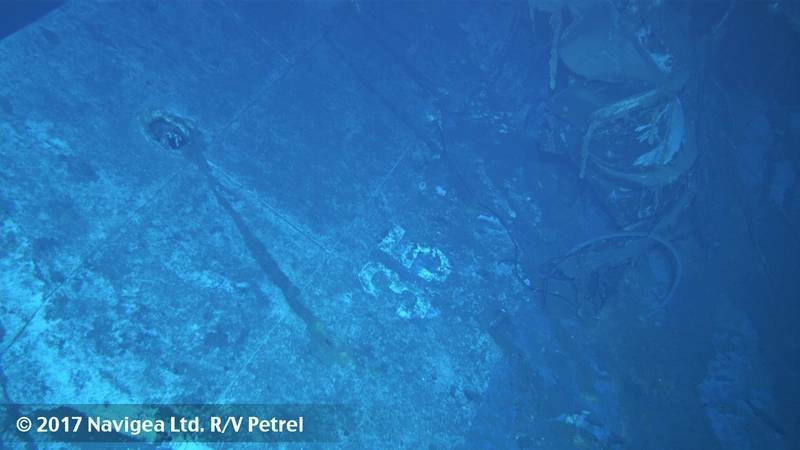 With help from some of the most capable and advanced equipment available, the Vulcan team located the wreckage of the USS Indianapolis on August 19, resting 5,500 meters below the surface in the Philippine Sea where it will remain undisturbed as a naval war grave. 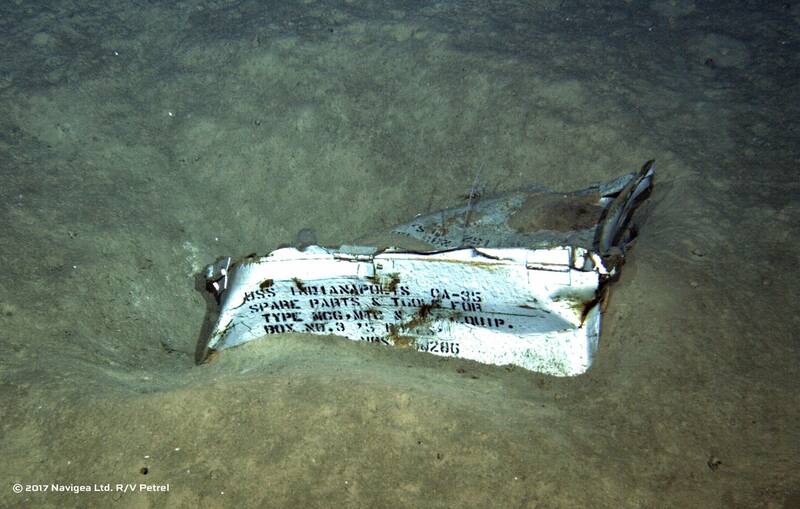 The wreck’s exact location was provided to the U.S. Navy exclusively, as the wreck is property of the U.S. Navy. 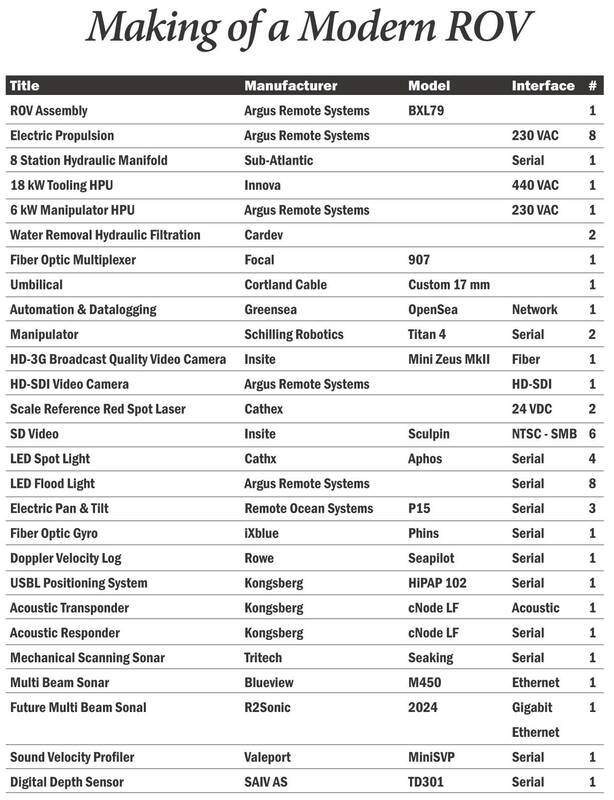 Special thanks to Carl Barrett and the team at 3U Technologies, LLC.